Why would you want to post to Facebook with your voice? Imagine sitting on your couch, potato chips all over your shirt, a drink next to you, and all you want to do is tell your friends how glorious your life is. I mean, you have all these great snacks and rarely a worry. Why wouldn’t you want to shout from the rooftops that your life is great? However, you don’t want to pick up your phone because you’d get chip grease on it. You don’t want to pick up your laptop or iPad for that same reason, and you definitely don’t want to get up and head to your PC/Mac. The reason for that is obvious. It responds with a lovely “Ok, posting to Facebook ‘My life is glorious! '” Your life is now complete. Now, if the reason why you’d want to do this isn’t already apparent, then I can’t help you. How do I post to Facebook with Just My Voice? A PC/Mac or a mobile device with iOS or Android on it. Once you have those, you’re ready to go. Let’s follow the tutorial! Step 1 – Have your Google Home Setup and ready to go. Once you have an account at IFTTT.com and/or the mobile application on your iPhone or Android smartphone, you’ll have the ability to connect a Facebook account. Using IFTTT, search for Facebook and then hit connect. From there, you’ll have to add in your Facebook account information. When you initially setup your Google Home device in step 1, you will have used a Google Account to do so. Open IFTTT and search for Google Assistant. Once you find that, hit connect again and then log in to the same Google Account you used in the Google Home setup process. 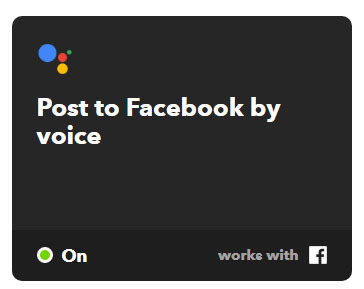 If you struggle to find it, enter the Google Assistant application within IFTTT and you’ll find it in that section of the application or website. Truthfully, I’m not sure why you have to wait. You just do. We’re talking about waiting for a minute…not ten. The reason must be related to an update physically on the Google Home device. The reason I say this is because if you ask the device to post immediately after enabling this applet, she will tell you that she doesn’t know how to do that yet. It must be using some onboard memory to store a very small amount of information on the device itself. It’s not every day you can post to Facebook with your voice. Oh wait, now you can do it every single day of your scurvy little life. Enjoy. Next Post Google Home – Making Shortcuts Easy!